Prenatal vitamins are the secret weapon of supermodels, as they enhance skin while making nails and hair grow long & healthy. Mom-to-be or not, read why Zahler Prenatal + DHA 300 Premium Multivitamin Formula is the ideal supplement for your beauty, body, brain & vision needs. 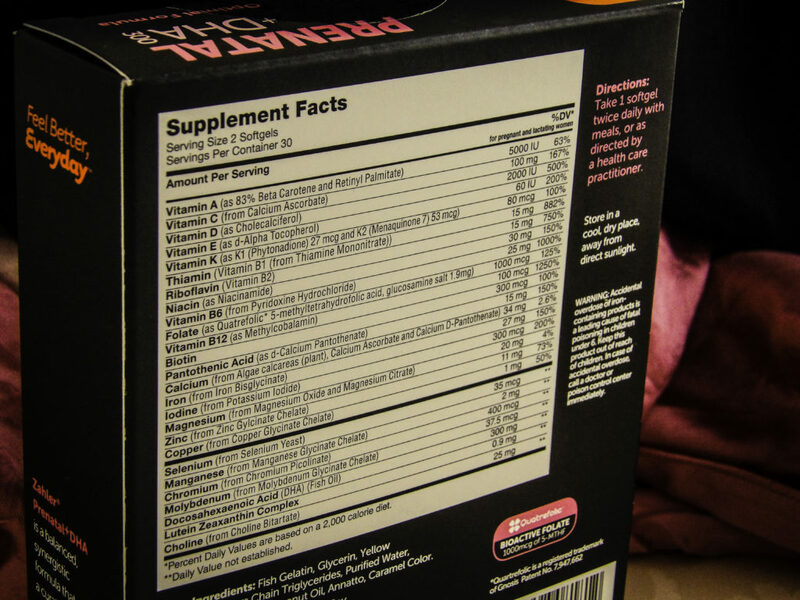 We’ve all read how the best multi-vitamins are prenatal supplements. After all, if it is good enough to keep a baby growing optimally and keep the mother healthy, isn’t it good enough to keep you in top form, both inside and out? When taking a prenatal vitamin strictly for the beauty benefits, it’s important to find a balanced multi-vitamin. A prenatal vitamin is often superior to the popular ‘hair and nail vitamin formulas’ because these targeted formulas tend to omit necessary minerals for overall health, including those related to optimal brain functioning. One prenatal vitamin we like for its’ beauty and brains support is Zahler Prenatal + DHA 300 Premium Multivitamin. DHA is vital for neurological development in utero, but it is also crucial for maintaining brain and eye health throughout life. If you do not eat fatty fish three times a week or regularly eat walnuts or chia seeds, DHA likely needs to be supplemented. B2 (Riboflavin) helps proteins function. B3 (Niacin) regulates cholesterol. A Niacin lack causes anemia and tiredness. B9 (Folate or Folic Acid) is involved in DNA, red blood cell, and RNA production. Folate prevents anemia. This form of Folate is Quatrofolate, which is the authentic form of folic acid. B12: Many women have low B12 levels which result in health and beauty problems. Some problems include fatigue, weight gain from a slow metabolism, brittle hair, dull skin, and weak fingernails. Low B12 also makes one feel mentally groggy. Taking B12 quickly makes one feel more energetic. Magnesium deficiency is common in adults, causing muscle aches, poor digestion, anxiety, PMS, headaches, and trouble sleeping. Iron: necessary for hair growth, energy, healthy blood cell production and the production of the entire suite of the Vitamin B’s. Manganese is paired with iron to improve bone structure. Lutein Zeaxanthin Complex is the optimal vitamin pairing for vision health. Some report improvement in their vision or the delay of the deterioration of existing eye health problems. This is an expensive vitamin combination in of itself and is rarely seen in a multi-vitamin, much less in dosages significant enough to be effective. We’ve seen just a Lutein/Zeaxanthin combos as seen in this dosage cost more than this entire supplement does. This is important since the National Institute of Health states that interactions among supplement ingredients can be harmful if the proper dosing is not observed and controlled. For this reason, it’s best to take a pre-natal formula produced by a careful and conscientious manufacturer such as Zahler, who has achieved high scores on product purity, nutritional value and ingredient safety with independent evaluators such as Labdoor. GMP CERTIFIED MANUFACTURING: This product is produced in a GMP certified facility. GMP stands for “good manufacturing practices.” GMP’s were developed with specific established FDA guidelines, which is the only accredited American National Standard in the dietary supplement industry. THIRD PARTY TESTING: All Zahler products undergo the National Public Health and Safety International Organization’s third party testing to verify and certify they meet these public health and safety standards. Products, like Zahler’s, that meet the rigorous seven-step standards can bear the NSF mark, as this product does. With so many brands to choose from, the quality control Zahler submits their products to gives me the confidence to select this multi-vitamin. The Zahler Prenatal+DHA formula is free of gluten and contains no artificial dyes or additives. EASY TO SWALLOW: The softgel capsules are slick and not too big so I found them to be very easy to swallow. I do have problems with larger pills and found my former multi-B vitamin often too difficult to swallow, even though it was coated. These are no problem to swallow even on the first try. KOSHER: All consumers benefit from the extra scrutiny this product receives when qualifying for its Kosher Pareve designation. Whether you’re pregnant and want the best for your baby, or you are just looking to stay healthy and keep your hair, skin and nails in top form, check out Zahler’s formula! You can also get 20% off with code PRENLDHA at checkout! Thanks for sharing! I was on the lookout for a perfect prenatal, I’ll definitely be ordering these with the code. I use prenatal vitamins for hair growth. This sounds a lot better than the formula I get at the drugstore. Wow, that really covers all the B Vitamins! I end up swallowing a handful of different capsules of each kind of B. It would be nice to only take one! I’m looking for a good multi to make my nails stronger. Awesome! Let us know how they work for you! It really is a high quality formula! I know the feeling! It is really nice that this is just one pill! This has so many of the recommended nail growth vitamins and supplements!